If you are looking for a potty training chart to make potty training fun and motivating for your child, consider our two book kit. The activity book has tons of tips to help you find something distinct to your child’s personality. The tips were collected from moms who were asked, “What worked best for you?”. 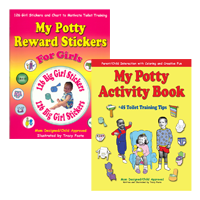 When using these potty training books together, we suggest starting with the activity book. Read through the tips which contain many suggestions on what has worked for different toddlers. Try to choose some ideas that would go well with your toddler’s personality. Begin using the activity book without even telling your child about the sticker book. Use the activity book as something fun to do together and introduce potty training in a non-threatening manner. Post the colored pages on your refrigerator or in the bathroom to make your child feel proud. your child to sit longer, relax and hopefully produce something into the potty). It is very important to make sure your child is ready for the next goal. Go at your child’s pace. Just like in school, we usually don’t move from a grade of C to an A. Most of us go, “C”, “C+” to “B-” to “B” and so on. Be sure to make a big cheer for each accomplishment! Tracy Foote is a mother of three young children. After roughly 11,000 diaper changes, she wanted something to expedite and ease the pressures of potty training (on both parent and child) while adding a little fun and humor.